When you play Bald Head Island Golf Course in your Myrtle Beach golf package, you will feel like even though you have paid to play the course, you are trespassing. We mean that with all the “residents” that live on the course year round – gators, deer, foxes and ospreys and all the other wildlife that call Bald Head Island golf course home – these animals were just letting you play through. Bald Head Island golf course, which is located just two miles off the North Carolina coast has been delicately carved out of the forest and is impeccably maintained to give the golfers playing the course a round full of scenery and wildlife. Bald Head Island Golf Course opened in 1974 and was designed by George Cobb. You may know George Cobb by his other famous courses such as Quail Hollow in Charlotte, NC (home of a PGA tour stop), Sea Pines Plantation in Hilton Head, SC and he even tackled the Par 3 course at Augusta National Golf Club (home of the Masters Championship). 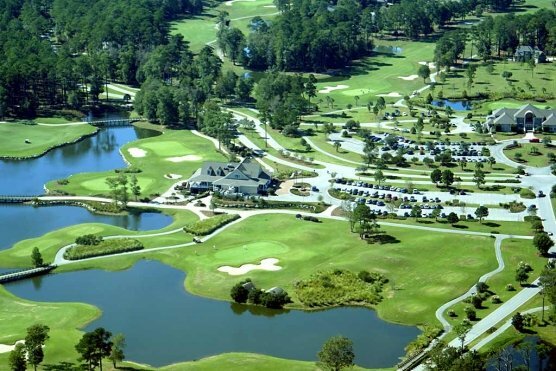 Like every beautiful course, updates are occasionally needed and Tim Cate stepped in (think Big Cats golf courses just across the NC border here in Myrtle Beach) back in 2009 and did a most excellent job in keeping the changes significant, while subtle. Some of the renovations including the widening of the fairways to eliminate the blind tee shots. They returned over 35 acres of the course to natural areas, thus requiring less maintenance by the grounds crew. One subtle change for both playability and scenery was on the famous No. 16. While being one of the most memorable holes on the Bald Head Island Golf Course prior to the renovations, the elevation of the tee boxes provides a gorgeous view of the Atlantic Ocean on this downhill Par 3. They replaced the greens with Mini Verde creating a green with a faster and truer roll to it. The tee box on hole No. 7 gives you the most picture perfect view of the Old Baldy Lighthouse – so be sure to stop and soak in the 200 year history for a few minutes before teeing off on this hole.